A while ago I put a little bit of time into making facesets for Time Fantasy. Here is the base that I made. Free to use and edit. NOTE: These might appear blurry because they’re upscaled for the web. Click them to see them at the correct 100% size. Each face fits into a 32×32 tile. These are really good! They fit very well with your texture pack’s overall feel. But… how do you upscale them so they can be used in rpg maker without getting them all blurry? You can use the “nearest neighbor” option when scaling pixel art to preserve the details. It has been quiet here for a while. Any news on the next pack being released or this face pack being finished? Loving the art style for my game thus far and would love to add to it. Do you make winter tile and tent like this in next pack? Monster pack and 80+ RPG Char will be on Steam? Cause i’m buying only steam and i want buy this. 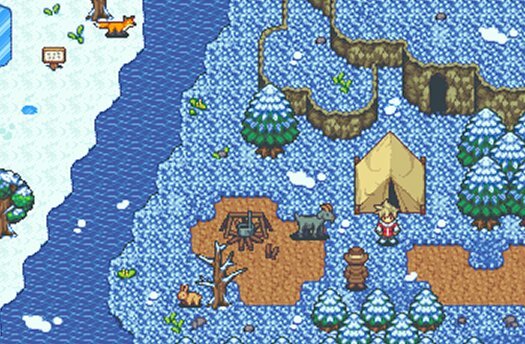 RPG chars are already on steam– the first RPGMaker time fantasy pack includes characters and tiles. But in TF pack no weapon animation. By the way love that you release a non-rpg maker licence for these seperately. There’s so many RPG maker packs I’d like to use that require you to use their engine. You’ve really helped my game get going in the direction I want it to by offering an alternative! So thanks.